Canning Season is Officially Open! By mid-June, both the Kid and I are jittery. He’s excited about the end of the school year and I’m just as excited about the official beginning of canning season. Of course I can preserve all through the year, but June is when we start our annual fruit picking pilgrimages to gather pounds and pounds of fruit to freeze or preserve. Pure joy to us DIY folks. Joy! As the summer grows into fall, I’ll be putting up peaches, a few chutneys and relishes and lovely things with pears and apples. Will you find any of these goodies under the Christmas tree this year? Oh! 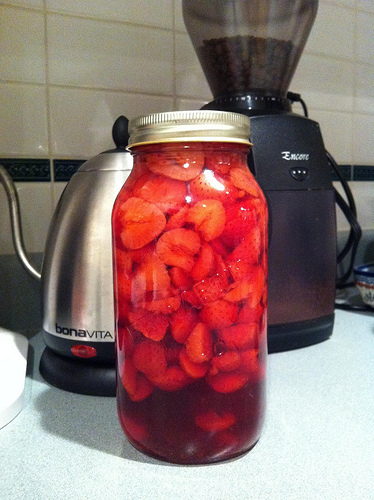 And not to be forgotten…strawberry vodka!